Don't forget to enter the Handknit Heroes giveaway! Ends in one week! 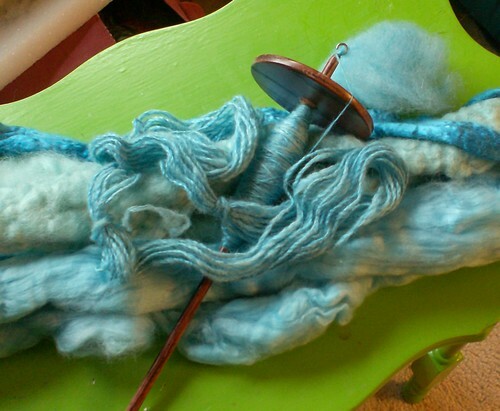 I've begun carding and spinning the roving I dyed. My plans are to spin up a cabled 4-ply sock yarn, all shiny and blue and soft and gorgeous. And it is, if I do say so myself. I've spun and plied a small sample, and it will ply up to a heavyish sport weight, which is a little heavy but okay. It should knit up well on size 2 1/2 or 3. The 4-ply makes a good round yarn, which would be good for cables, but I'm not sure what exactly I'll make from it. I'll have a little over 4 ounces, so plenty for a pair of socks if I spin it all up. The bamboo and nylon in it make is so slick and so shiny. It has an almost iridescent, two-tone color because the bamboo shines blue and the wool is more turquoise. I'm very excited about it. It's a big spinning project (normally I do 2-ply yarns! 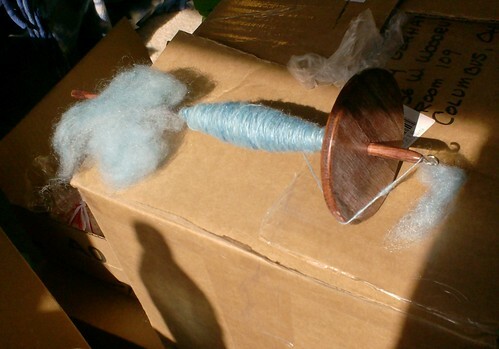 this is twice the amount of spinning) but I think it will turn out very rewarding. It's beautiful fiber, very shiny and slippery. It's less than 50% wool, but I'm hoping it will be springy enough to make good socks. After I've spun it, I might decide to use it for something else, but it would make some very comfy socks indeed, if a little thicker than I'm used to. Oh nice! This is a great hobby! If only I knew how to knit! Tsk! Really beautiful! I got to try spinning once. It was fun!